Air Franc e flight 447 plunged into the Atlantic Ocean en route from Rio de Janeiro to Paris on June 1, 2009. The causes of the plane crash are a sequence of pilot errors from 1 of the 2 co-pilots in the cockpit. This concludes Jean-Pierre Otelli, a pilot and an expert on aviation safety. He published volume 5 of Pilot Errors in October 2011. His conclusion is based on data from the black boxes that were recovered 2 years after the crash. However, not everyone appreciates the conclusion. This is in particular true for the National Union of Airline Pilots - in French the Syndicat National des Pilotes de Ligne (SNPL), Air France's main pilot union. Therefore, the SNPL takes to court and initiates a first case for defamation. When a judge dismisses the case, the SNPL decides to initiate new proceedings. This time for violating the principle that court investigations are confidential, and a breach of professional secrecy. In this case they have no success either. The judge rules that there is no ground for prosecuting and dismisses this case as well. However, the SNPL is persistent and goes to the Paris Court of Appeal. The court considers first that Otelli "expresses himself in good faith on the basis of accurate facts." Second, it considers that "the collected information is consistent with the course of the accident." And third it considers that the pilot's alleged right of privacy in the cockpit "must fade away in the face of the contribution to informing the public on a question of general interest such as aviation safety." Thus, the SNLP loses again. Maître Philippe Blanchetier - the lawyer of Otelli and his publisher Altipresse - explains that "the public has an absolute right to be informed of the facts that contributed to a crash, which caused the death of 228 people. Pilot errors must be known and acknowledged by everyone to better avoid them." And he adds: "What happens in a cockpit before an air disaster can no longer be the subject of an omerta from airline pilots who, like all citizens, are accountable in a transparent way." 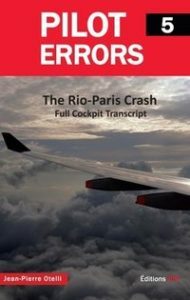 Jean-Pierre Otelli's book Pilot Errors (Volume 5) is available in French, German, English, Finnish and Portuguese. Related: "Where is the captain?"